Hello everybody! I’m Mackey from the Business Development Department. A little while back, I took part in Game Connection America (GCA) 2018, held in San Francisco. GCA is a business event held in San Francisco at the same time as the Game Developers Conference, better known as GDC, a technology conference event aimed at game developers. It aims to connect companies developing games with publishers and distributors who sell them. There were a lot of game developers like us there, and with a small booth and appointments made ahead of time, we held a series of 30-minute meetings. We were able to participate thanks to the cooperation of the Japan External Trade Organization. The GCA venue, AT&T Park. As for the business event center, I thought it looked like a baseball stadium…and it turned out to be just that. It is the home stadium of the San Francisco Giants. There were a lot of company booths set up in a wide corridor of what looked like the VIP seating section. Our booth was like what you see in the picture above. 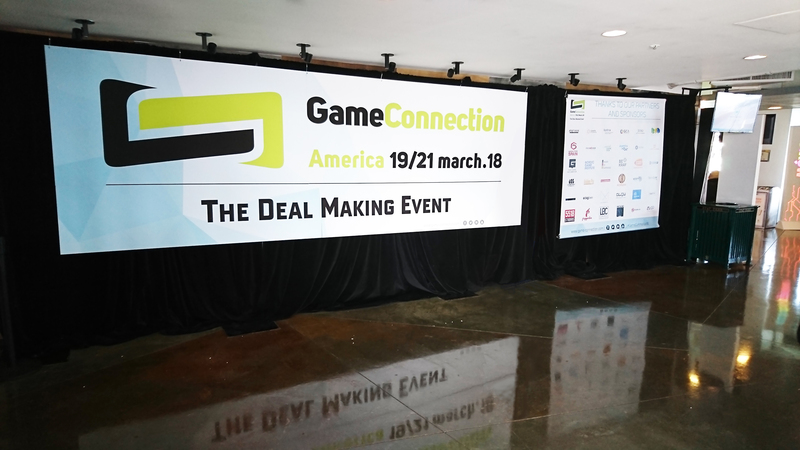 Since it was held concurrently with GDC, at the business meetings at GCA, aside from North American companies, there were also representatives of the game industries from Asia and Europe who gathered there. During our business meetings, we showed a movie showcasing our past achievements, and for customers interested in VR, we held a demo session of our VR game, Last Labyrinth. There were two major reasons why customers wanted to meet with us. The first was as a potential candidate for game development projects. The other was an interest in distributing our VR game Last Labyrinth. Many of the game publishers interested in our company for game development were from the Asian regions, such as China, Taiwan, South Korea, etc.. I think that companies like ours are highly valued in China nowadays, thanks to the popularity in recent years of so-called “Japanese-style Chinese games,” which are smartphone apps that make use of Japanese voice actors and Japanese style graphics, alongside our operation achievements with TENKAHYAKKEN -ZAN- . And as for publishers and distributors interested in handling Last Labyrinth, it was not North America, but mainly European companies from Germany, France, and the UK that were interested. Considering the reasons for this, first of all, investment in VR technology in North America is focused on large enterprises and investors who anticipated the future potential of VR technology. As a probably result of this, the use of VR tech is currently highly anticipated in sports events and as a way to convey the real conditions of car races, while investments for game development might be placed on the backburner. On the other hand, in Europe there are plans in place in many locations to establish large-scale VR game arcades, and VR content for home gaming systems are also underway for the UK and France markets in particular. With that in mind, a lot of European distributors and VR providers gathered for the demo of our VR game Last Labyrinth. The reason for this, is that those in the industry who are familiar with VR games tend to shy away from VR horror. The underlying reason being that even if you understand that the world is fake, when the brain perceives the experience, the feeling is not that of a simulated one, but rather a strong feeling of terror, as if what is playing out is actually real. Finding publishing and distribution for Last Labyrinth was one of our goals for this event, but apart from that, we also had talks regarding development for new VR titles. We already have a proven track record for developing games for overseas Asian publishers. In the future, I would like to take on game development projects from publishers in North America and Europe as well, and even undertake operations for overseas titles. And so, in the midst of everything, over the course of 3 days we had meetings with about 30 companies. It was hectic, but we managed to reach out and connect with more than a dozen companies, and the results are at the very least satisfactory. I would like to continue to participate in such opportunities, and to show the international game industry who we at AMATA are.